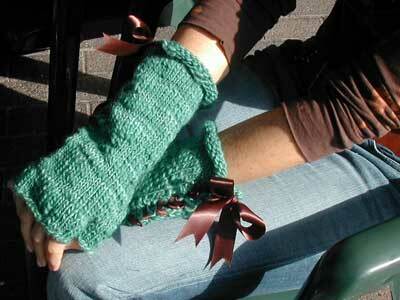 Are you ready to knit a pair of gloves from the fingers to the cuff? Using i-cord fingers? If so, then today is your day! 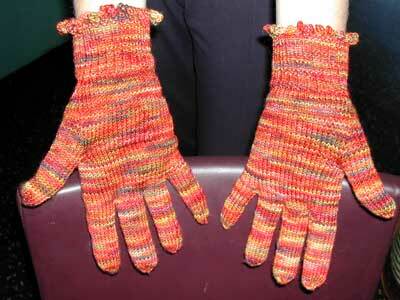 Here is the 1st installment of my I-Cord Gloves serial pattern. Like serial books, which are published one chapter at a time, serial patterns are published over several short installments. The i-cord finger technique comes from Meg Swansen and her excellent book, "Handknitting with Meg Swansen". Please note: this pattern is still in the prototype phase -- i.e. I haven't finished the gloves yet. Yarn -- Koigu or a comparable yarn. Needles -- Double pointed needles in the size you need to obtain gauge. I used US3. Optional: If you want to knit the body of the glove using 2 circular needles instead of double pointed needles, you'll also need 2 circular needles in the same size as your double points. 7 stitches equals 1 inch in stockinette stitch knit in the round. M1 -- “Make 1” stitch. Before knitting the next stitch on the left needle, use the right needle to pick up the loop of the stitch in the row below -- back to front -- and place it on the left needle. Knit this loop to add a new stitch. 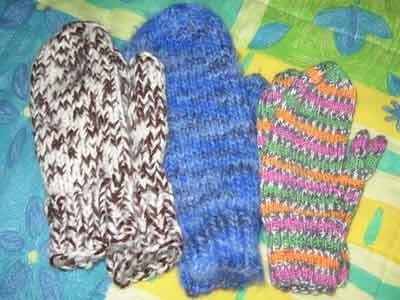 Each finger is knit individually as an i-cord tube. These fingers are really fun to knit and are very portable. Drinking a cup of tea? Knit a finger. Stuck in traffic? Knit a finger. Watching your kid's soccer game? Knit a finger. Waiting for the water to boil? Knit a finger. Before you know it, you'll have all 10 fingers ready to go! Label each finger as you go – it’s easier than you think to mix them up! Deb suggests skewering them -- in order -- onto a spare DPN. 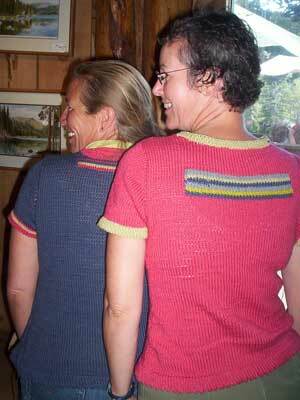 For more information on knitting i-cord fingers check out this previous post. If the i-cord finger technique is not to your liking, several experimenting knitters have suggested alternatives. Please pop over to their blogs for details. Purly Whites uses the turkish cast on to get each finger started and then knits the finger in the round using 2 circular needles. Cara uses the i-cord technique to get each finger started and to increase to the final number of stitches. Once she's past the last increase row, she switches to knitting the remainder of the finger in the round. It's so important to take all patterns with a grain of salt, adapting them to fit your personal knitting style and preferences -- experimentation and adaptation are two keys to success. Knit 1 row of i-cord as follows: slide the stitches to the other end of the needle and knit one row. In the second row of i-cord, increase 5 (5, 5) stitches as follows: k1, [m1, k1] 5 times => 11 (11, 11) stitches. In the next row of i-cord increase 2 stitches as follows: k3, [m1, k3] 2 times, k2 => 13 stitches. Continue working i-cord on 11 (11, 13) stitches until the tube measures 2 (2¼, 2½) inches or until the tube is the length of your pinky. Because there are so many stitches, the i-cord tube will not close. If you inspect the back of your tube, you'll see a ladder of horizontal bars. Have no fear, this is correct and you'll see why shortly. This new loop becomes the 12th (12th, 14th) stitch, joining the other 11 (11, 13) on the piece of scrap yarn. In the next row of i-cord, increase 4 stitches as follows: k1, [m1, k1] 4 (4, 4) times, k0 (0, 1) => 9 (9, 10) stitches. In the next row of i-cord increase 5 stitches as follows: k2, [m1, k1] 5 times, k2 (2, 3) => 14 (14, 15) stitches. Continue working i-cord on 14 (14, 15) stitches until the tube measures 2½ (2¾, 3) inches or until the tube is the length of your ring finger. Put the 14 (14, 15) ring finger stitches on a piece of scrap yarn and close the i-cord gap as you did for the pinky ending with a total of 15 (15, 16) ring finger stitches. In the next row of i-cord, increase 4 stitches as follows: k1, [m1, k1] 4 times => 9 (9, 9) stitches. In the next row of i-cord, increase 6 (8, 8) stitches as follows: k2 (1, 1), [m1, k1] 6 (8, 8) times, k1 (0, 0) => 15 (17, 17) stitches. Continue working i-cord on 15 (17, 17) stitches until the tube measures 2¾ (3, 3¼) inches or until the tube is the length of your middle finger. Put the 15 (17, 17) middle finger stitches on a piece of scrap yarn and close the i-cord gap as you did for the pinky ending with a total of 16 (18, 18) middle finger stitches. In the next row of i-cord, increase 4 (4, 5) stitches as follows: k1, [m1, k1] 4 (4, 5) times => 9 (9, 11) stitches. Knit 1 row of i-cord. In the next row of i-cord, increase 8 stitches as follows: k1 (1, 2), [m1, k1] 8 times, k0 (0, 1) => 17 (17, 19) stitches. Continue working i-cord on 17 (17, 19) stitches until the tube measures 2½ (2¾, 3) inches or until the tube is the length of your index finger. Put the 17 (17, 19) index finger stitches on a piece of scrap yarn and close the i-cord gap as you did for the pinky ending with a total of 18 (18, 20) index finger stitches. In the next row of i-cord, increase 6 (6, 8) stitches as follows: k2 (2, 0), [m1, k1] 6 (6, 8) times => 15 (15, 17) stitches. Continue working i-cord on 15 (15, 17) stitches until the tube measures 2 (2¼, 2½) inches or until the tube is the length of your thumb. Put the 15 (15, 17) thumb stitches on a piece of scrap yarn and close the i-cord gap as you did for the pinky ending with a total of 16 (16, 18) thumb stitches. In the next installment, we'll join the fingers and the thumb to the body of the glove, preparing for the thumb gusset shaping. This is so interesting and I'm thinking it will eliminate my ugly picking up of stitches to close the gap when I was knitting from the wrist up to the fingers. Can't wait for the next instalment to see what's next. This is really exciting. I think I need to go out and buy some yarn for gloves, now. Nona is a very brave knitter! Can't wait to see you put the fingers onto the "hand". Thanks so much for the very helpful tips you include in your blog!! I have found them very useful. I love Nona Serial Patterns...Now to find some yarn! :D Something about that picture makes me ROTFL!! I think I will join in your glove making, I need some quick distraction from the shawl I'm knitting. 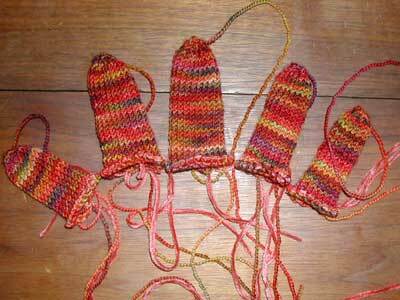 When I made mine, I knitted all 10 fingers at once, and skewered them onto a spare DPN to keep them in order--which was especially helpful while I was knitting the first glove and the other 5 fingers were just sitting around, twiddling the thumb. What great colors. I can't wait to see the finished product. THANKS for doing this on the blog, I'm dying to try gloves but irrationally intimidated by glove patterns, this is soooo do-able. Great way to start the week. 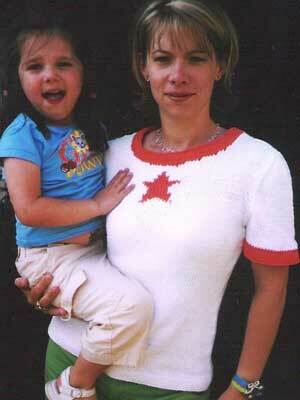 Holy wow. It MUST be Halloween. Those look like severed fingers to me!!! Eeeee! Seriously though, this is a great post! 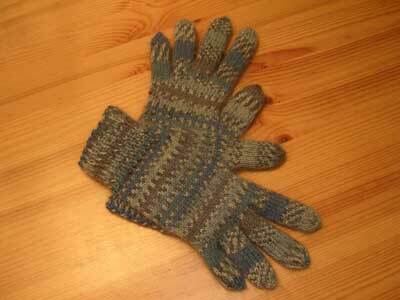 My DH has been hinting at the prospect of receiving handknit gloves this Christmas. This may just be the thing! Too cool! And I am a big fan of serialization -- Charles Dickens would be proud! Damn it, I'm caving. I'm printing this out and trying this tonight. Oooooh...I have some extra Cherry Tree Hill Supersock that might just get made up into fingers very soon. Can't wait til the next installment! Ingenious! 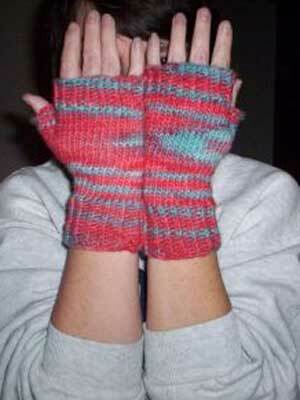 I'm not a glove-wearer but I could be tempted to knit up a pair for my mom for Christmas - quick and easy. What a great pattern!! Well done you!! When will the next installment appear? How many installments will there be, do you think? I just ordered a big bunch of yarn that should work for gloves and I hadn't even found your pattern yet! How cool is that? Well done me! Thanks for sharing with us! nona here: please excuse me for not crediting Meg in this posting like I had in my previous postings on the topic. I've updated the posting accordingly. Just surfed over from Zeneedle! Love this! I was put off by gloves before, but I can do this...Thanks! Which Koigu yarn did you use? KPPM or Kersti? I have Koigu KPPM in the stash, but I wasn't sure if this would work. Hi Nona, I just finished a scarf and have decided I want gloves to match. Approximately how many yards of yarn will it take to make your I-Cord gloves in the large size. I'll be using Interlacements Peru which has a gauge of 4 st per inch on size US 8 needles. 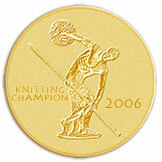 Do you have any knit-alongs going or planned for the near future? Nona, what a lovely pattern. i love the colors you used and would like to make it in the same. it looks like koigu PPPM colorway 148 - is that correct? also, how many yards of the koigu is needed for a pair of gloves? thanks much for your detailed instructions. I'm trying out this I-cord pattern, and I can't figure out how to close the gap. When I loop the horizontal bars at the back, it doesn't close, leaving a hole at the tip of the finger, and it makes a very loose seam. 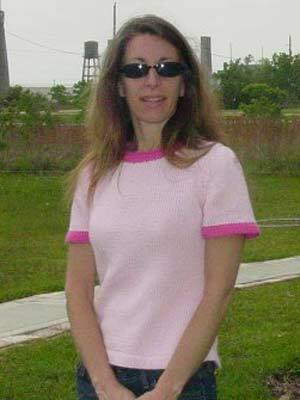 Hi, Just wondering about what to do with the loose ends? Like when the fingers are put on a scrap piece of yarn.